The 91W1-20600 UPS is a small form factor style 600VA Standby (Off Line) type Uninterruptible Power Supply (UPS) with surge protection built in. 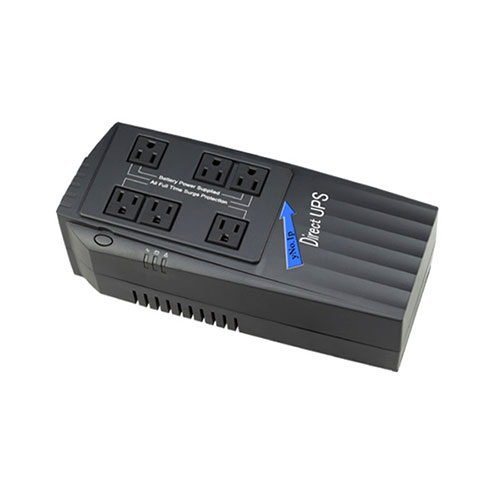 This light and compact UPS has 6 outlets total. 3 that are battery backup outlets and 3 that are surge only, and is perfect for a PC and a monitor, your gaming system and screen and most of your peripherals. The 91W1-20600 will give you about 8-10 minutes to save your work or your game during a power outage, while at the same time protecting it and your other equipment from spikes and surges. This model also includes a user replaceable battery.